This month for Taste and Create I was paired with the blog Seduce your taste buds written by Indian blogger Padmajha Sureshbabu. I chose her recipe for Potato n peas. It was hard to chose a recipe but I had a bag of besan (gram flour) left from last month’s Taste and Create and I thought I would see which recipes incorporated it. This recipe uses a little besan in the sauce and I was intrigued. I remember a home economics lesson in high school when some visitors from India were invited to teach a guest class. 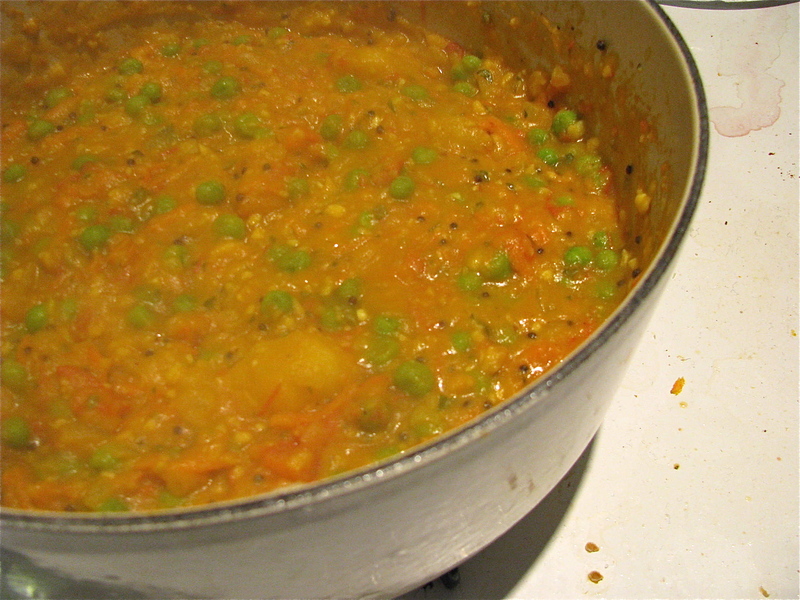 They taught us a potato and pea curry and from what I remember the recipe called for at least 10 cloves of garlic. The curry was so pungent that cooking and eating it necessitated a shower and change of clothes. We didn’t have time – or spare clothes so we caused quite an uproar when we went to our next class. Padmajha’s recipe did not include garlic, but I added some just for nostalgia. Not 10 cloves though! Although I already had besan, the recipe gave me the excuse to go to Patel Brothers (Kenny and Old Henderson) for some additional ingredients. 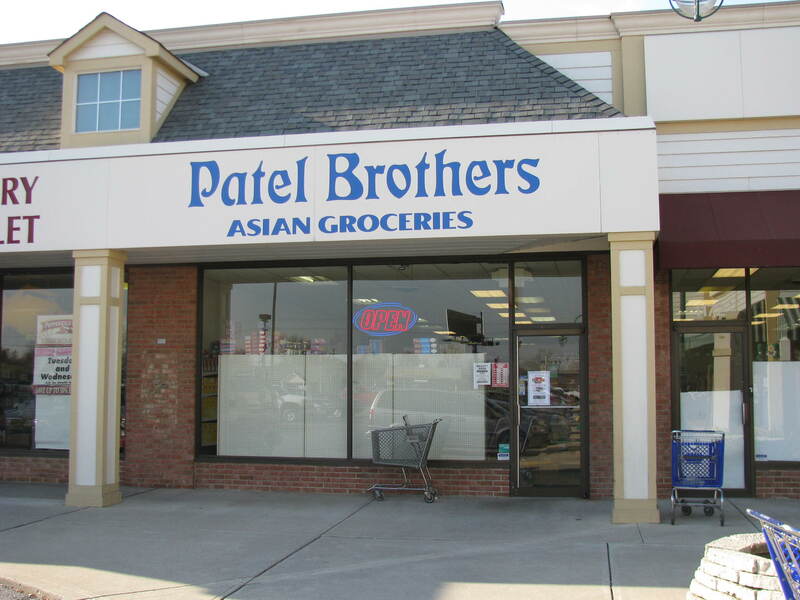 Patel Brothers has a wide range of spices, dried goods and fresh produce. I needed mustard seeds, curry leaves and chana dal (chick peas) and I couldn’t resist a pack of cumin (jeera) papadums. 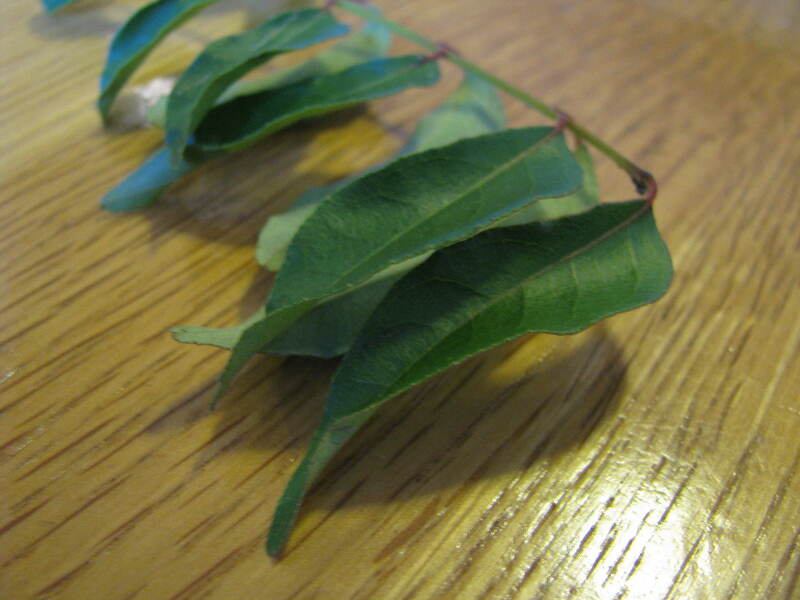 I had not cooked with curry leaves before. I found the recipe a little confusing in places so I did have to improvise a little. I wasn’t sure whether to chop the peppers or when to add the seasonings listed at the end. I was completely lost as to how to use the gram dahl so I left it out. As well as adding garlic, I added extra water and a little garam masala and a squeeze of lemon at the end just to brighten the flavor. The result was tasty and surprisingly sweet and we ate it with a pile of papadums and some mango chutney. 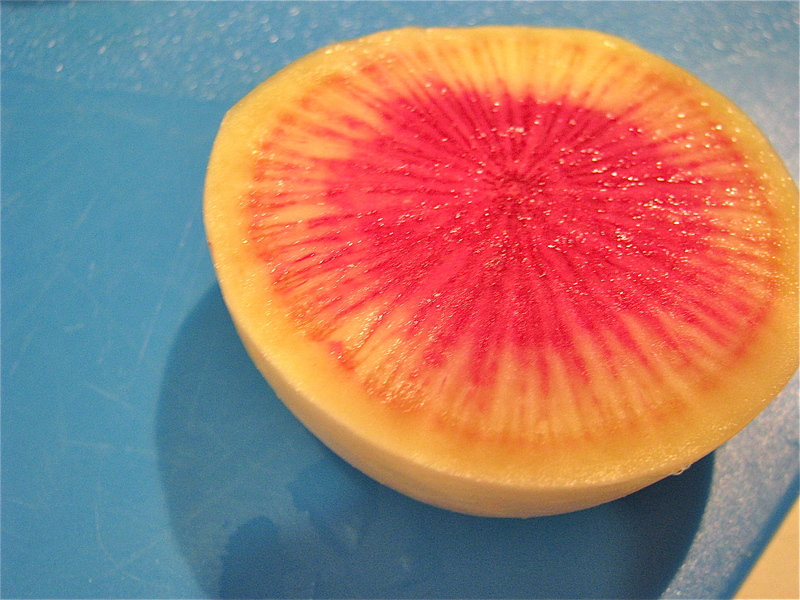 I couldn’t resist adding a photo of the stunning watermelon radishes I was nibbling on while I cooked. 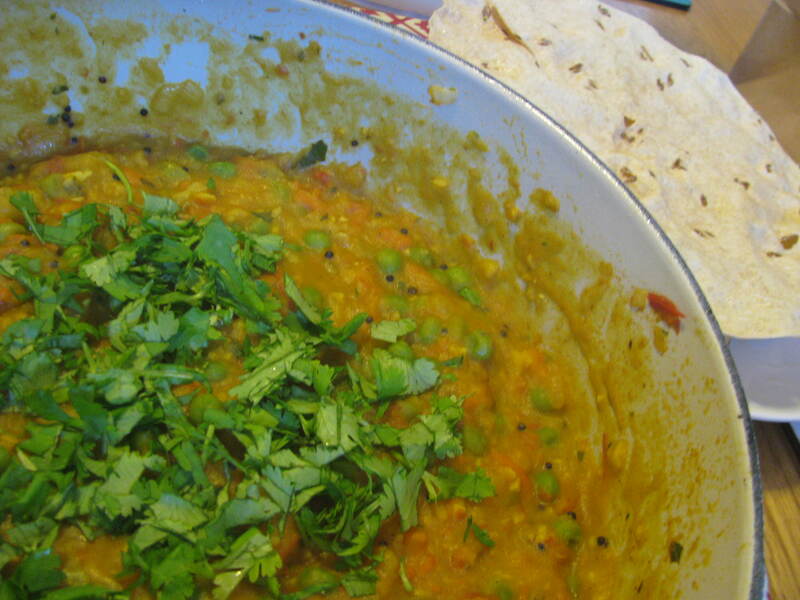 Ur curry makes me wanna grab a plate of steamed basmati rice with pickles & papads ….cool blog!!!! Hi! !Your peas and potatoes look soo good!! Btw,regarding the confusion in the dish,just wanted to let you know that,this dish can be prepared by two methods.. If are following recipe 1,I have mentioned that u have to slit the green chillies and add the seasonings in step 1. If you were following recipe 2,the gram dhal has to be ground along with a few other ingredients mentioned in line 1. and follow the procedure as recipe 1 and add the ground paste instead of besan n follow the steps of recipe 1. Since my mom is not a huge fan of garlic,i made the dish without it.In case you use garlic,add it in step 1 with the seasoning and wait for it to brown lightly and proceed. Thanks. 🙂 I used method one because I did not have any coconut. Do you leave the chillis in the dish or take them out later on? And do you soak and leave the gram dahl whole? Those were the things I wasn’t sure about. I hope you find something to cook that you will enjoy. We leave the chillies as such[remove it from our plates while eating].The gram dhal in the seasoning section has to be put into the oil as such[no need to soak]. I have bookmarked a couple of recipes from ur blog and will post it soon..